DESPITE MULTIPLE SOURCES claiming Liverpool have agreed a fee with Sunderland for the sale of attacker Fabio Borini, the Italian will start for the Merseysiders in today’s pre-season friendly with Preston at Deepdale. It was expected that the 23 year-old would move to the Black Cats for £14m after scoring ten goals for the club during a loan spell in the North-East last season. Borini had returned to Liverpool earlier this summer and featured for them in a friendly clash against Brondby on Wednesday. New signings Rickie Lambert and Emre Can will make their debuts for the club today with Brendan Rodgers naming a strong line-up. Email “Fabio Borini named in Liverpool team for today's friendly with Preston”. 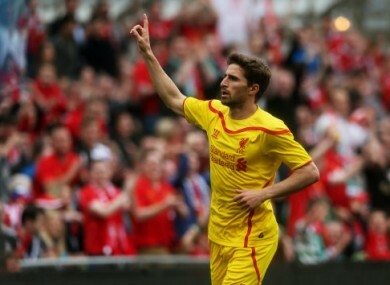 Feedback on “Fabio Borini named in Liverpool team for today's friendly with Preston”.